I love these Murano glass beads and I think you will too! They are round in shape and each measure about 14mm. The color is a very pale Aqua Blue with Icy tones due to the layers of genuine 24 KT white gold foil wound with the color. The beads are encased in glass layers helping to protect the foils and colors. So gorgeous! 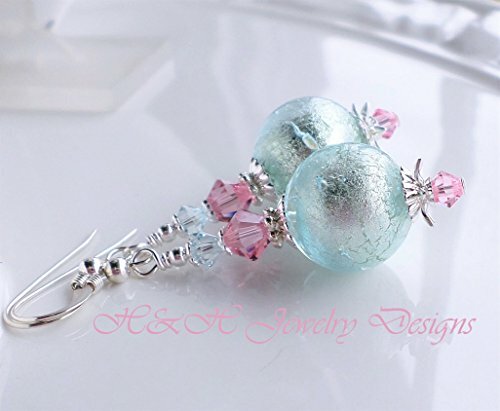 I have added coordinating Swarovski Crystals in Light Rose Pink and Pale Blue called Light Azore, both a great pick. Accents included are bright silver plated brass, ending with STERLING SILVER ear wires, with ball and coil details. Total length: 2 1/4 inches. If you have any questions about this product by H&H Jewelry Designs, contact us by completing and submitting the form below. If you are looking for a specif part number, please include it with your message.